Boy, wait ‘till you get this BIG SPRING INTO SUMMER ISSUE in your hands! Never before have you had the power to completely understand the entire Marx Castle Story, but now, thanks to the efforts of some very dedicated collectors, the final installment is right in your little pinkies! This is the end of a five part series, already upon us because this time, we wanted to cover every Marx Castle in as short a period as we could and not drag it out. So what began with Prince Valiant and the Medieval Castles in PM87, Richard Greene & 60mm Robin Hoods in PM89, 54mm Robin Hood and High Wall Castles in PM91, now concludes with the spectacular moated sets and walled castles that lasted into the 1970’s, all right here in PM93. I remember doing the Gas Stations that wound up being so prolific I thought they could never end; then Farms, and Civil War, all of which covered many issues themselves, that this time we wanted to hop only one issue with each installment in order to put a neat wrapping on the whole story within the year. And so it is, exactly one year later, done and in! We have a lot of very dedicated folks to thanks, including venerables Rick Eber, George Kroll, David Schafer, Francis and Jason Turner of the Marx Toy Museum, and for taking over with Parts 4 & 5, this issue we again thank that Clark/Kent duo Kent Sprecher and Clark “Billy Hill” Haberman. I would have to say this installment, with its never-before delineated castles and contents, was to me the most difficult of all the episodes, and we are very glad to have these gentlemen aboard. It wasn’t an easy ride, as the first drafts came in a full year ago and were endlessly revised, vetted by collectors and honed into a sleek, readable and enjoyable tour de force. And wait till you get to the charts these two devised. And better bring your microscope, there a lot of detail on page 23. You wanted castles and by Jove, you got 'em all wrapped up for easy research and contents finding. Thanks guys, and thanks to all who helped. This is one for the books! 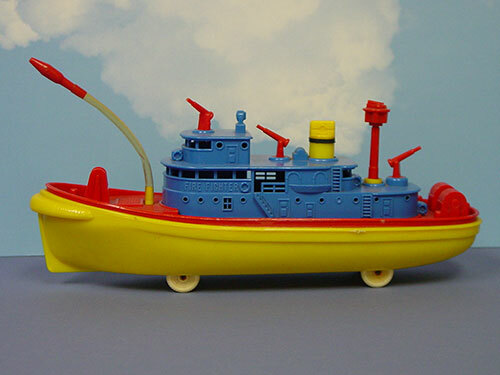 Also this issue we “Shove Off into Spring” with a report on Marx’ impressive and seaworthy Atomic Warship, in its several variations including a big colorful English variant. This was a story started by Randy Sabousky and only completed when we acquired the incredible Marx store display for the ship, very impressive indeed. I know Randy would have been proud. The Marx Fire House story stirred up more than a little interest from collectors, who began sending in cool examples of vintage fire toys almost as soon as the issue hit the stands. SO this issue we feature some studding pieces courtesy David Schafer, Bill Vaughn, Rick Eber, George Kroll, and Tim Young. This is mighty cool stuff, and it doesn’t stop there! The display ads and classifieds are sparkling with new offerings which we hope you’ll order something from our fine dealers, all of whom have an excellent reputation for sales, service and quality. You’ll find Rich Egan, Rick Eber, Allan Ford, Larry Lovely George Guerriero, the fabulous new Trojans from LOD, Toy Soldiers of San Diego, all lined up with an incredible selection just awaiting your summer perusal to jumpstart a new cycle of acquisitions for each and every one of you. 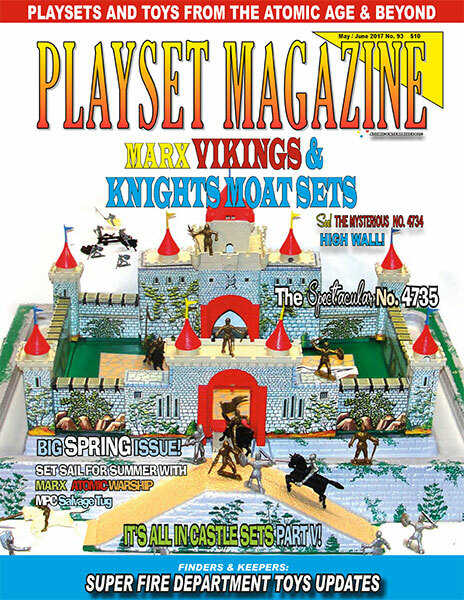 And that is just what we hope you’ll do as we bring you Issue 93 the Marx Vikings & Knights, Moated Sets and Beyond Grand Castle Finale! Helping get the Warship out to sea is a needed push from Mark Hegeman’s MPC Salvage Tug, complete in its nifty store display box. Plus there's all the news, stories of finds, and even a one about little Lianna Pawlick getting her first playset, the Netflix Backfire, and a Marx Medieval Castle selling for an epic price.